AS POINTED out about an hour ago, Linux is winning in mobile platforms. There is evidence of this coming from different directions, so it seems irreversible. When GNU/Linux was winning on the server side, Microsoft paid SCO which back then launched the never-ending SCO case, so we know what Microsoft is capable of. 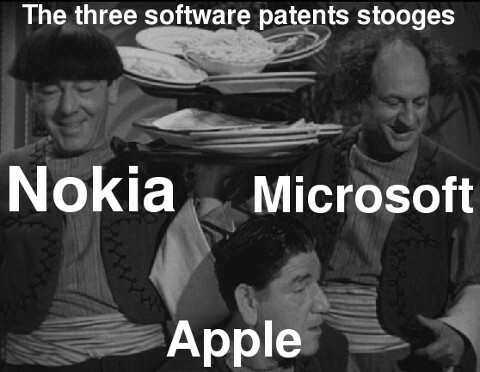 Microsoft also tried (but got caught by the OIN) to sell some Linux-hostile patents to patent trolls [1, 2, 3, 4, 5, 6]. The biggest mistake one can make is assume that Microsoft is “dead” and therefore doing nothing more to harm GNU/Linux. Eric Schmidt, Google’s Executive Chairman and former CEO, took the stage at the Dreamforce conference in San Francisco today to talk about a host of topics, including the success of Google Apps, his feelings about Steve Jobs, Google’s recent acquisition of Motorola, with the conversation with Salesforce CEO Marc Benioff even ranging into Schmidt’s thoughts on the current landscape facing the U.S. patent market. The executive chairman began by addressing the purchase of Nortel Networks’ roster of patents by a group of buyers that included some of Google’s rivals, including Microsoft and Apple. Fellow TechCruncher MG Siegler covered the back-and-forth between Google and Microsoft that unfolded in regard to the supposition that the group that bought the Nortel patents was effectively attempting to cut the legs out from underneath Android. Yes, this is the same Apple that has initiated a patent war  with these smartphone rivals. And it’s the same rival that has tried to remove competing products from the market, rather than agree to negotiate a licensing fee. And it’s the same company that patented multi-touch gestures 26 years after they were invented at a research university. And it’s the same company that allegedly doctored evidence in European courts  to support its lawsuits against Android. Yet in Apple’s rose-colored glasses it is Samsung and Motorola who are bullies. Apparently Apple is irate about these companies’ countersuits, which rely largely on patents covering wireless communications.